Miley Cyrus recently released her music video for Wrecking Ball and she looked INCREDIBLE. Her look was very stripped back (pun intended) and I absolutely love her simplistic makeup look. The minimal eye makeup, flawless skin, and bright red lip is so simple and yet so perfect. So I looked in my collection for items I love, and found the perfect products to create this look! I held out on this product for SO LONG. I don't know why, but I was so hesitant to buy it. I hate buying high end mascaras because I find them so expensive and I'm way to picky about mascara to make that kind of commitment. I picked it up on a whim, and I'm in love with it. It works perfectly on me (note: mascara works differently on everyone). It gives me very long, thick, false looking eyelashes- just like Miley's! Sephora. Miley's eyebrows are perfectly filled in and I love this pencil. I have brunette since my hair is much darker than Miley's. remember, your eyebrows should be a shade lighter than your hair! Sephora. This is a gorgeous, soft, "barely there" matte eyeshadow perfect for lightly accenting your natural eye crease. 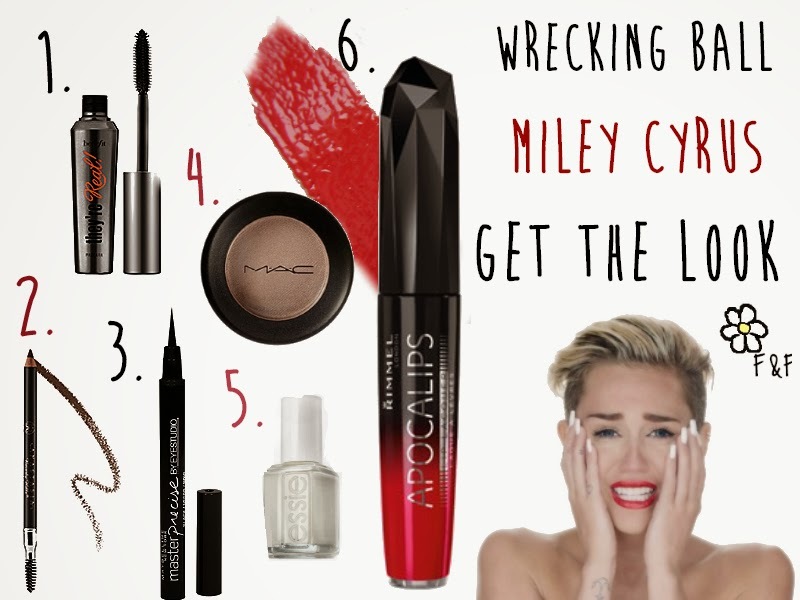 Using a blending or smudging brush, gently place this shadow in your crease to create Miley's look. mac cosmetics. Self explanatory. Miley is wearing a opaque white polish, this is an opaque white polish. I like Essie because the brushes are thin and the formula is usually super easy to work with. Drugstores/Salons. So there you have it, how to get Miley's gorgeous look! You don't have to love her, but you have to admit she looks stunning. Great Post! I just recently discovered Benefit's They're Real mascara as well and it is absolutely amazing! I really want to try the Anastasia Perfect Brow Pencil, or any of her products for that matter. Also, I just saw the Rimmel Apocalips displayed in Walgreens, here in the US, last week. thank you! don't you just LOVE that mascara? I really like them! I bought the brow powder a while ago and i liked it but i think i'm more of a pencil girl! The apocalips have a different name in america right?